Music plays an important part in our lives, from a very early age. Mom’s-to-be might play soothing tunes to the unborn baby, music can be used to calm restless children and certainly music is used at parties, concerts, in churches and ceremonies. In fact, life without music would be quite dull! So, what are the benefits of music in the early days? Children who are exposed to music and learning to play an instrument or sing will grow up with enhanced skills. Research has shown that this early exposure teaches kids to do more than one thing at a time. They learn to use their eyes and ears at the same time, as well as develop the muscles used to sing or play an instrument. Also, according to this list, some instruments are better than others so pick wisely. Hand/eye, ear/hand and advanced motor skills are learned at an early age. Children who learn music early develop better ability to focus, hand and eye coordination improves, and mental recall is honed. Children who learn music understand that practise makes perfect and that repetition goes a long way to reinforce their memory. Research shows that the side of the brain used for learning music is the same side that works for learning languages. Children who learn music early will develop a better verbal communication, which is an advantage through the rest of their lives. Children who learn music become self-assured. The very act of standing up and playing or singing in front of an audience stands them in good stead for any career path they choose. Job interviews and business meeting hold no threat to the person who is confident. To learn music takes discipline. The child who commits to this learns that hard work is followed by rewards. Children who learn music have a 15-20% better ability at solving mathematical problems. Here is some more reading on the topic. Working together with other people towards a common goal means a person who is well-adjusted and committed. This is carried on into the workforce and the child grows up to become a natural leader who is dedicated to their work. Any time you can spend with your child is beneficial. Music requires extra time and commitment from both parent and child. This helps to strengthen the bond between you because you have a common interest which lasts a life time. So, it’s easy to see that music benefits children in early age. There are many ways to introduce music into their lives. Encourage your little one to bang on pots with wooden spoons, sing a song at bedtime in place of a nursery rhyme, turn on some music while you are feeding them, join a music group with your child, watch a musical together. 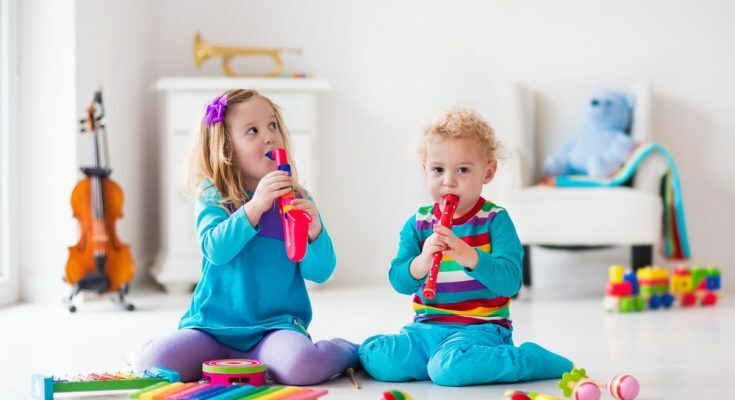 The list is almost endless on how to involve your child in music. Not only will it be beneficial to your child through the rest of their life, it will also strengthen the bond between you and develop a great relationship between child and parent.